Feeding Trafalgar Square's numerous pigeons becomes illegal from Monday. People caught feeding the birds face possible prosecution and a £50 fine, under a new by-law. But campaigners have said a legal loophole will let them carry on giving food to the birds. 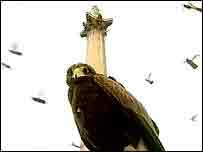 Mayor of London Ken Livingstone said pigeon droppings have caused up to £140,000 damage to Nelson's Column and the square. He wants visitors to the central London landmark to stay and enjoy a "cleaner, healthier environment", rather than just taking a few photographs and leaving. The square has recently reopened after a £25m facelift which saw the pedestrianisation of the five-lane road which had divided it from the National Gallery. "The introduction of a cafeteria on the square has given it a more pleasant environment," said Mr Livingstone. "None of the improvements would have worked if the square was still infested with thousands of pigeons." Licensed feed sellers have been banned, seeds are now sucked up by vacuum devices and Harris hawks and megaphones are used to scare pigeons off. But while numbers have reduced from up to 4,000 at lunchtimes to about 200, some people still turn up to scatter seeds. And Julie Fletcher, from the Pigeon Action Group, said there were ways of getting around the new by-law. She said: "There are parts of the precinct and an area just south of Nelson's Column, that do not come under Trafalgar Square. "So people will therefore be perfectly within the law to feed pigeons in those areas." A demonstration against the by-law was held outside the National Gallery. "Neither the pigeons or the feeders have taken flight yet"
Most Popular Now | 9,214 pages were read in the last minute.